I’m looking for a loop (either as a visual programmed one or as a lisp routine) that interpolates between the last points and the first points of pairs of juxtaposed bpf-libs. I attach here a simplified example of the result I’m trying to obtain. Thanks in advance for your support. 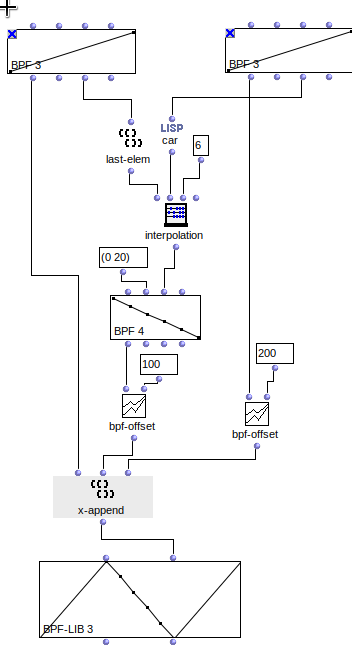 I don’t know any ready-made method which interpolates the contained bpfs of two bpf-libs and concatenates all 3. But it shouldn’t be too hard to build your own. Check attached for something you can possibly build upon. Fwiw, i’ve added a #'bpf-concat method in the sources, which concatenates two bpfs (or bpcs) with some choices of what happens in the range between them. In your case you could just loop through the successive bpfs of the two bpf-libs, and collect the ‘bpf-concat’-enated bpfs for each inside a new bpf-lib, no? Hmmm...many 'what-if's and different use-cases involved with this, making it difficult to set up something general enough to qualify to include in OM. For instance, what to do when there are different numbers of bpfs in the two bpf-libs? 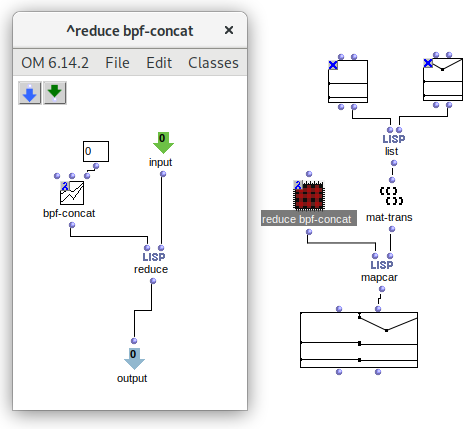 the bpf-concat solution is the best and it works. But I still don’t know how to use it in a lambda patch in order to do automatically with two consecutive or juxtaposed bpf-libs in a series of n bpf-libs what I did manually (doing multiple loops) in the patch of the screenshot here attached. Any hint is of course very appreciated. P.S. of course in a bpf-lib concat method all the bpf-libs should have the same number of bpfs, like in the example in my screenshot. Thanks again for all. #'bpf-concat’s optional parameter f2-offset can be set to a specific transition length (x) between the two functions, setting it to 0 will give you a step transition between the two f’s. Hmm… this version always adds a transition function between the two bpfs, would it make sense to not add any in-between function? the reduce function (which I completely ignored: my fault!) embedded in the lambda patch is bloody brilliant. Now the transitions between the bpf-libs (4 in my case) is fully automated and smooth (see the screenshot). Fancying some further features for bpd-concat, it would be very interesting being able to choose between different types of transition function between the curves, like in the good old Diphone Studio (if I remember correctly, there were Linear, Logarithmic, Exponential, Truncate, Medium, Smooth, 2Smooth and TruncMed as preset options). Thanks for your really illuminating tips. Please ignore (and possibly delete) this double post. There’s a serious bug in this forum that duplicates attachments and replies that’s been haunting the forum for years.